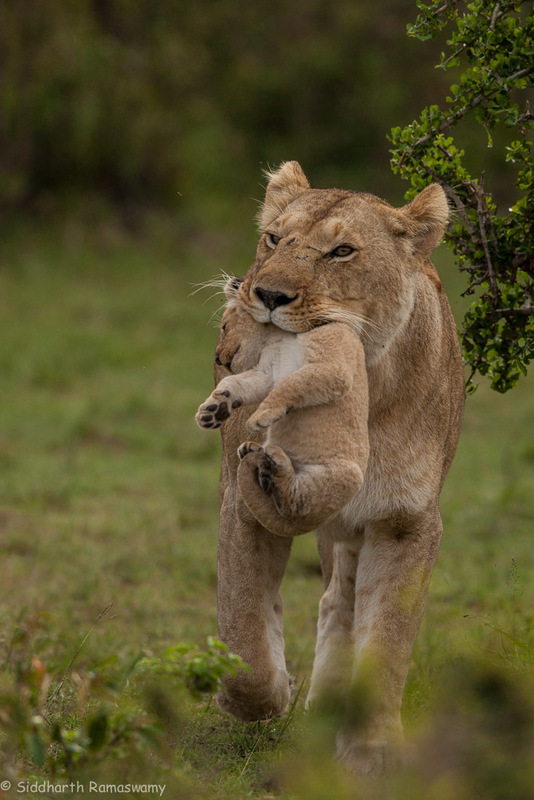 An adult lioness walking not twenty feet from your vehicle is an experience that gives you the feeling, “my hair stood on end”. 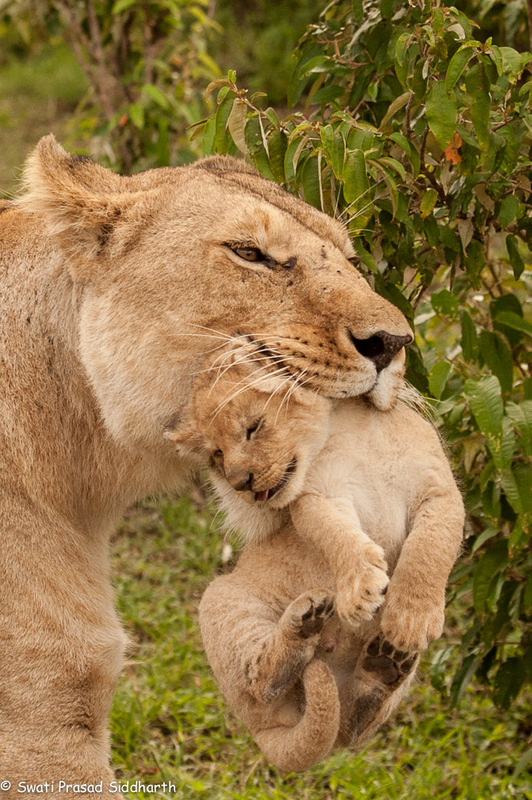 But a mother lioness walking by with her three week old cub in her mouth does this and more. My hair did stand on end. The awe of such a moment is etched on your soul forever. Whenever I think of it, this is the reaction I have. She walked towards us with that precious bundle in her mouth. She stopped and delicately put it down, but barely lifted her head. Picking it up again with the gentlest of grips – those jaws can tear apart any hide and crush any bone! – she walked past and disappeared into the thicket. She had to move her babies into a secure hideaway. The rains were coming. She did not once glance at us. She did not, obviously, think we were any danger to herself or her babies. Maybe she even found some security in the line of vehicles forming a barrier between her and the dangers of the bush. Maybe she did not even notice us! Her instincts did not warn her. Little knowing that we, humans, are the biggest threat to the existence of her very species, she trusted us. @Swati, though you hear tremendous moving stories of human compassion, we have proven to be the most unkind species …. unkind to others and to themselves ! And by selling everyone dream the “american dream” – 2 cars minimum per family, junk food, lots of clutter around the house – we are racing towards a situation where nature will have to react in a way that we would term cruel, but will be necessary. Yes. You are perfectly right. It frightens me to think of the path we humans have chosen … So much of inhumanity, cruelty and worst of all callousness to our own and every other species. Not to mention the earth itself. That is why I have mixed feelings about humans even those with good intentions getting too close to wildlife, I believe it de-sensitizes them to the inherent danger that humans with bad intentions have. Reminds one of the tiger and the man in the Delhi zoo.